I went to a conference (work related) in Philadelphia this past week. Knitting on the train was great. Unfortunately I didn’t get to any yarn shops. The closest yarn shops hours didn’t work out with my schedule. I packed enough yarn for several projects but not enough clothes. In fact I ran out of clothes. Oops! FOs: 2 swiffer covers, an apple cosy. All made from Sugar ‘n Cream cotton yarn in Black, Cottage Twists, and Hot Green. WIP: A very good start on a soaker (using this and this) for one of my granddaughters using Cascade 220 (Green color???) and Sensations Kashmira (Aqua, discontinued). The apple cosy has a red bag in it as I didn’t have any apples. The leaf is a felt cut out that I sewed on instead of the knitted one in the directions. I also found a cute lady bug button. The one swiffer cover in the center is truly made from leftover yarn from all the other things I made from that yarn. I do see a pattern with my color choices. I like green. 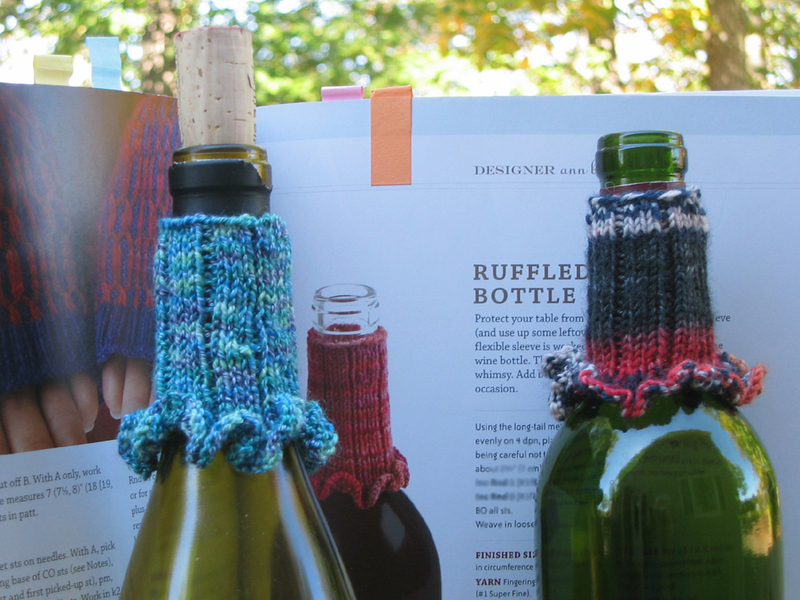 I needed the dpns from the Ruffled Bottle Sleeve (Knitted Gifts) for the soaker so I finished it Sunday afternoon. I used about 10 yards of leftover sock yarn for each. Nothing like a well dressed wine bottle. This entry was posted in finished object, knitting and tagged apple cosy, knitting, pattern, soaker, Swiffer cover, wine by Patti_is_knittinginflashes. Bookmark the permalink. I love the Swiffer covers I’ve knit. They come in really handy. 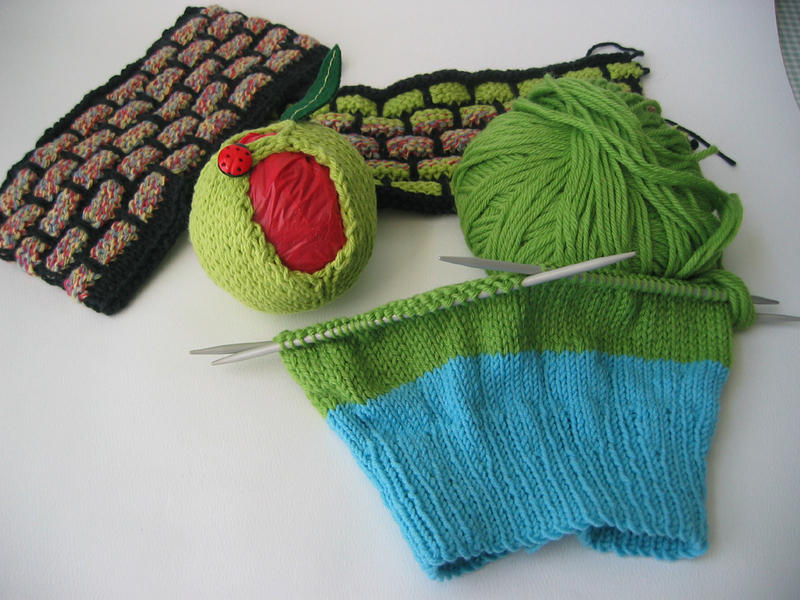 When I first looked at the apple cozy I actually thought you had knit a spanish olive! That is sooo cute! I love your projects. I thought of an olive as well I love those swiffer covers. That soaker is going to be so cute!